We estimated trophic position and carbon source for three consumers (Florida gar, Lepisosteus platyrhincus; eastern mosquitofish, Gambusia holbrooki; and riverine grass shrimp, Palaemonetes paludosus) from 20 sites representing gradients of productivity and hydrological disturbance in the southern Florida Everglades, U.S.A. We characterized gross primary productivity at each site using light/dark bottle incubation and stem density of emergent vascular plants. We also documented nutrient availability as total phosphorus (TP) in floc and periphyton, and the density of small fishes. Hydrological disturbance was characterized as the time since a site was last dried and the average number of days per year the sites were inundated for the previous 10 years. Food-web attributes were estimated in both the wet and dry seasons by analysis of δ15N (trophic position) and δ13C (food-web carbon source) from 702 samples of aquatic consumers. 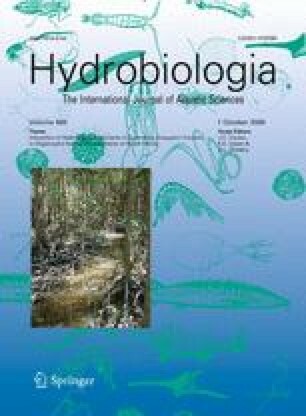 An index of carbon source was derived from a two-member mixing model with Seminole ramshorn snails (Planorbella duryi) as a basal grazing consumer and scuds (amphipods Hyallela azteca) as a basal detritivore. Snails yielded carbon isotopic values similar to green algae and diatoms, while carbon values of scuds were similar to bulk periphyton and floc; carbon isotopic values of cyanobacteria were enriched in C13 compared to all consumers examined. A carbon source similar to scuds dominated at all but one study site, and though the relative contribution of scud-like and snail-like carbon sources was variable, there was no evidence that these contributions were a function of abiotic factors or season. Gar consistently displayed the highest estimated trophic position of the consumers studied, with mosquitofish feeding at a slightly lower level, and grass shrimp feeding at the lowest level. Trophic position was not correlated with any nutrient or productivity parameter, but did increase for grass shrimp and mosquitofish as the time following droughts increased. Trophic position of Florida gar was positively correlated with emergent plant stem density.